Generally, people like to use softer words to overcome awkward situations during interpersonal interactions. To avoid talking about events or things that appear to be not suitable in a polite society people use euphemisms. 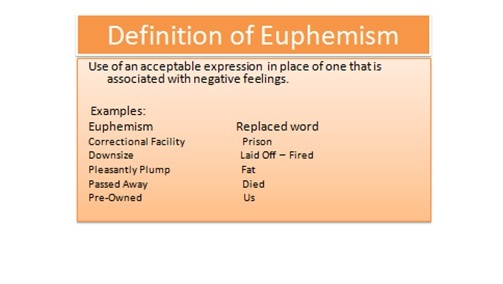 Euphemisms are defined as the act of substituting words that generally evoke strong emotional reaction by harmless ones. Euphemism is defined as use of a socially accepted word that is both mild and harmless in the place of a word or expression that is generally considered unacceptable, strong or unpleasant. For example, people avoid mentioning the word death and replace it with a genteel expression like passed away. Mild words are not likely to provoke undesirable emotions that lead to stress and awkwardness between individuals or groups. A number of example of euphemism are used in everyday life. Soft euphemism: These are used instead of rough and literal words, and they play the role of hiding the rough nature of the words. Physically challenged instead of lame or blind. Euphemisms that are used in a cordial environment – Using numerous euphemisms are necessary when you are interacting in a polite society where rude words and gestures are forbidden. A little heavy instead of obese. A little tight instead of drunk. Euphemisms that used to show disrespect – Some euphemisms are deliberately used to show disrespect without sounding rude or boorish. The sarcasm used is very subtle and sometimes passes over the head of the recipient, sometimes they are also used to lighten the atmosphere. 6) Couch Potato – someone who is lazy. 16) Couch Potato – someone who is lazy.